Michael Steinberger: Should Tennis Coaching Be Specialized? I didn’t watch much of golf’s U.S. Open last weekend. What little interest I had in golf has evaporated with Tiger Woods’s demise. In retrospect, I wasn’t watching golf when Woods played; I was watching him, and now that’s he's sidelined, possibly for good, I don’t pay nearly as much attention to golf. But I did see enough of the Open that it prompted a question. In golf, many coaches are specialists. You have swing coaches like Butch Harmon, short-game coaches such as Dave Pelz, and even coaches who focus exclusively on putting. My question is this: Could tennis coaching eventually become just as specialized? But what golf and tennis do have in common, aside from their country club images, is that both demand a high degree of technical aptitude; meticulous form and pinpoint timing are prerequisites to success. That’s certainly the case at the professional level, and it’s the reason why specialized coaching caught on in golf; every little bit of technical refinement helps. The same holds true in tennis. To this point, however, tennis has resisted any movement towards coaching specialization. The closest it has come to that has been the hiring of coaches for specific surfaces. 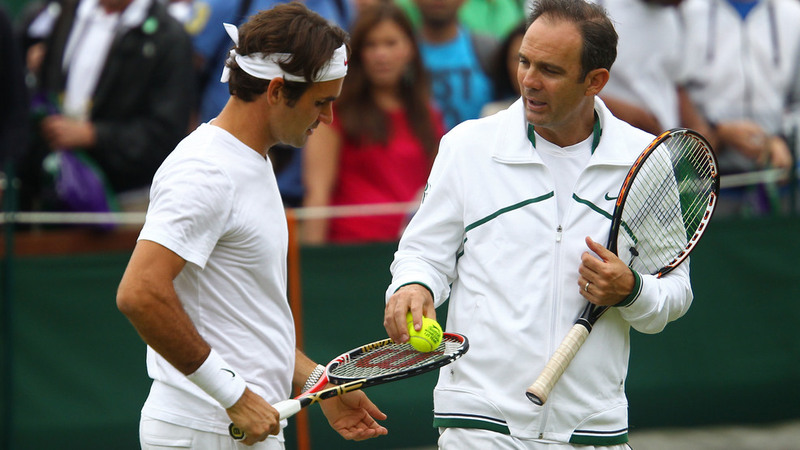 In 2008, Roger Federer enlisted Jose Higueras to help him win a French Open title. Last year, Stan Wawrinka hired former Wimbledon champion Richard Krajicek in a big to improve his grass court game. For this year’s grass court season, Wawrinka has turned to Tennis Channel’s Paul Annacone, the former coach of both Federer and Pete Sampras, the two greatest grass court players in history. Do these “situational” hires presage a broader movement toward specialization? Reached by email the other day, Annacone, who was in London for the Queens Club tournament, said that some degree of specialization was possible but was not sure that coaching in tennis would ever become as Balkanized as it is in golf. He said that the serve was one part of the game in which there might be a place for specialists. “The serve is an area where a specialized person makes more sense because it is a starting point and not a reactive shot, so technique is purely up to the player,” Annacone said. But he said he wasn’t convinced that we’d ever see coaches specializing in shots other than the serve and that such a division of labor would be undesirable. “In tennis, it is very important not to confuse the player; continuity in messaging is important,” he said. Like Annacone, Evert does think we might see the emergence of serving coaches. More so than with any other shot, power on the serve is dependent on proper technique, and the serve is also a devilishly intricate maneuver. “It is a different, more complicated stroke,” says Evert, who has coached, among others, both Andy Roddick and Madison Keys, two players renowned for their serves. “You have to go up at the ball, and it’s the one stroke where I think there could be specialists, coaches who teach it just a little better.” He also noted that there is still a lot of debate about optimal serving technique. “Platform versus pinpoint stance, how to properly load—I don’t think even the best coaches agree on the perfect technique,” he says. There could thus be significant opportunities for any coaches who advance our understanding of the serve and who devise ways of making it an even more potent and reliable weapon. Speaking as a recreational player who is often betrayed and tormented by his serve, I would definitely pay for that kind of specialized instruction. Sign me up.